Turkish rulers, from Ottoman times to the present-day neo-fundamentalist regime of Recep Tayyip Erdoğan, have never been comfortable with the Alevi Muslims. Counting a quarter of Turkey's current domestic and diaspora population of 80 million, Alevis emerged in the 16th century as eastern Anatolian peasant rebels. They supported Shia Persia, then governed by a mystical Sufi shah, against the Turkish sultan, who was also the supreme religious authority (caliph) of Sunni Islam. Alevi beliefs combine Shia devotion to Imam Ali Ibn Abi Talib, the cousin and son-in-law of Muhammad who was assassinated in 661, Sufi metaphysics, and elements of pre-Islamic Turkish shamanism and Kurdish social traditions. Aside from their Shia background, Alevis have nothing in common with the similarly-named Alawites, who are the foundation of the Syrian dictatorship of Bashar al-Assad. Turkish and Kurdish Alevis despise dictatorships, though many are leftist. Iran, which "certifies" the esoteric and extremely heterodox Syrian Alawites as proper Shia Muslims, has reached out to the Turkish and Kurdish Alevis—but this flirtation has been rebuffed. The Alevis do not wish to become pawns of Tehran. The Iranian clerical tyranny today no more resembles the Persian Sufi empire that inspired Alevi combatants nearly 400 years ago than the Syrian Alawites correspond to the Alevis. Although some Turkish and Kurdish Alevis follow some Sunni Muslim practices, including fasting at Ramadan (which begins this year on July 20), they do not pray in mosques. Rather, they conduct an impressive ritual led by women and based in dance, beginning with the lighting of candles and music performed on a long-necked oriental lute, the saz. This observance, the cem, is held in a cemevi, or cem house. Alevi festivals assemble hundreds of saz artists, with their instruments held high above their heads before they play them, to symbolize their identity. Erdoğan 's Justice and Development Party (AKP), like its secular predecessors, subsidizes Sunni mosques in Turkey and abroad, exercising extraterritorial control over them in Germany and elsewhere Turkish Sunnis emigrate. These functions are carried out by the Turkish state's Islamic affairs directorate, known as the Diyanet. But the condition of the Alevis is a case study in how Islamic authorities often treat heterodox Muslim believers as "apostates." Unfortunately for the Alevis, the Ankara government will not finance their cemevi or include them in the official Islamic affairs directorate. Instead, the Alevis are told that they should pray in the Sunni manner, in Sunni mosques. The pre- Erdoğan secular order, which banished Islam from the public sphere, held the same posture: religion should be excluded from politics, but only Sunni Islam was afforded official recognition in matters of faith. The situation of Kurdish Alevis in Turkey is triply negative. They are impoverished, members of a despised religious minority, and belong to an ethnic group that, according to most Turkish politicians, has no right to cultural autonomy. Since the early 20th century, Turkey has been considered a country composed only of Turks by citizenship and assimilation—including Greek and Armenian Christians, and Sephardic Jews, as well as Kurds and other minorities. Alevis in Turkey now express eloquent discontent with AKP policies on religion. Late in June, Kurdish Alevi writer Cafer Solgun, interviewed by the pro- Erdoğan Turkish daily Zaman (Time), averred that the secularist Republican People's Party or CHP was "manipulating" Alevis against the AKP. But he noted that AKP overtures to them, which he had supported and in which he participated, had been found unsatisfactory by the Alevis. Beginning in 2009, the AKP government organized seven "workshops" with Alevi organizations, a hitherto-unimaginable initiative. The workshops were restricted to Alevi entities inside Turkey, while much Alevi activity is centered in Western Europe (Germany may have a million Alevi residents today, out of about 4.5 million people of Turkish and Kurdish origin). Some Alevi representatives who attended the first workshop were dissatisfied and did not return for the other six. 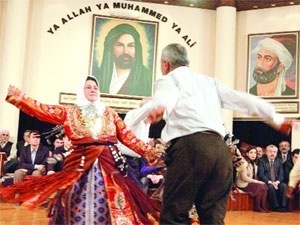 The Alevis perceived the workshops as opportunities for the AKP's Sunni clerics to browbeat them. "There were many Islamic theologians, especially in the last meeting, including past and present theologians from the state Islamic affairs directorate, who were invited by the government as if they were there to assert that Alevis' demands were not acceptable according to the Sunni interpretation of Islam," Solgun recalled. "In the end, it was a disappointment—a real surprise for us that the final report of the Alevi workshops highlighted the Islamic affairs directorate's priorities. The mutual demands of the Alevi organizations have been ignored. There was an implication in the final report that if cemevis were recognized, the Sunnis would be greatly disturbed." The disillusionment with Turkish party politics articulated by Solgun, as a Kurdish Alevi, was not limited to the AKP. Alevis are an important opposition constituency in Erdogan's Turkey. Kemal Kılıçdaroğlu, head of the CHP, is an Alevi. Solgun argued, "There are about 10-15 Alevi deputies from the CHP in parliament, and their family roots are Alevi, but they are not known for their Alevi identities. The same goes for CHP leader Kemal Kılıçdaroğlu. His roots are Alevi, but he is not very interested in the Alevi issue." Solgun remarked bitterly, "most of the Alevis have been seen as the guardians of a system that does not recognize them. . . . They carried the banner: 'Turkey is secular, and it will remain secular.' However, the system, which claimed to be secular, [did] not recognize Alevis!" In his view, "Alevis also believed that if there was no CHP, the Sunnis would massacre them. Alevis' interest in the CHP is built upon fear." Nevertheless, Solgun concentrated his criticism on the AKP. He declared, "The AKP leadership probably believed that no matter what they do, the Alevis would not vote for them, so they've given up on it. . . . We are talking about demands for equal citizenship rights. It should not matter to the government who those people vote for." Solgun called for abolition of the state Islamic affairs directorate, which employs 100,000 people and has a budget equal to that of five government ministries. He said, "The state should not be a part of this issue of belief and religion. The only thing that the state should do is ensure that there is freedom of religion and that nobody imposes his or her own beliefs on others." Solgun's remarks gained further relevance early in July, when parliamentary speaker Cemil Çiçek denied an Alevi request for a cemevi to be erected on the premises of the legislative body. The petition was put forward in May by CHP deputy Hüseyin Aygün. As described in the leading Turkuish daily Hürriyet (Freedom), Çiçek dismissed the proposal rudely, charging, "Alevism is not a separate religion," and that the house of worship for Alevis, as for other Muslims, is the mosque. The problem was aggravated when deputy prime minister Bekir Bozdağ repeated the claim, according to Hürriyet, that "Alevism was an interpretation within Islam and that Alevis are all Muslims." Specifically, Bozdağ emphasized, "The place of worship for all Muslims around the world is the same; their common house of worship is the mosque." There are widespread exceptions to this allegation, of which Bozdağ appeared ignorant. Outsiders may perceive the Sunni-Alevi controversy in Turkey as obscure and irrelevant, yet Cafer Solgun and other Alevis warn that a religious collision could surpass the threat of Kurdish radical leftism to national stability. Erdoğan has demonstrated anxiety over the bloodshed in Syria, but should be equally concerned about religious strife in his own land. For the welfare of Turkey, the Alevis should be granted equal standing as a religious community with conventional Sunnism.